TECHNOLOGY | B R O A D B A N D C O M M U N I T I E S | w w w. b r o a d b a n d c o m m u n i t i e s . c o m | J U LY 2 0 1 8 Conduit Infrastructure Provides Base for Smart Grid And Broadband Access The municipal utility in Estes Park, Colorado, solved a difficult fiber deployment challenge by using aerial conduit with multiple pathways for its smart grid. Now, if the town decides to build an FTTH network, the conduit is ready and waiting. 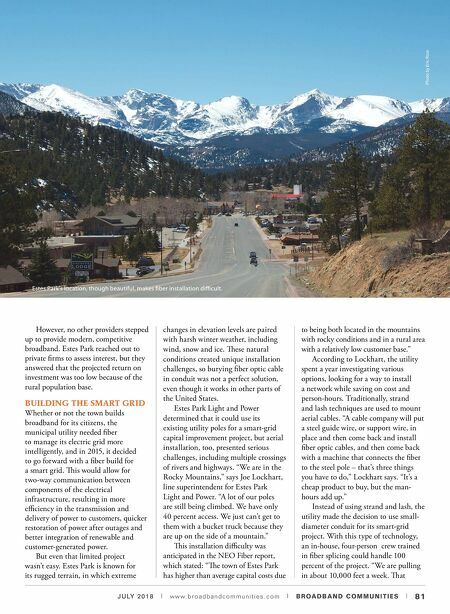 By Molly Gilbert / Dura-Line Corporation E stes Park Light and Power is poised to bring broadband to the town of Estes Park, Colorado. Today, many communities call high-speed internet the "fourth utility," after water, gas, and electricity. High- speed internet access is required not only for work but also for day-to-day life – scheduling doctor's appointments, checking homework assignments, even researching which government office to contact about barking dogs. Research repeatedly shows that communities that have access to broadband provide better employment opportunities, attract more entrepreneurial investments and have higher citizen engagement. e town of Estes Park recognized the need for high-speed broadband, and community leaders spent considerable time and resources researching their best options. Working with local leadership, consultants and regional partners, the community is in the final phases of deciding whether to establish a high-speed fiber broadband network offered through Estes Park Light and Power, its municipally owned utility. With a positive reputation for quick and efficient service and response time, Estes Park Light and Power serves about 11,000 customers in an area of 350 square miles. 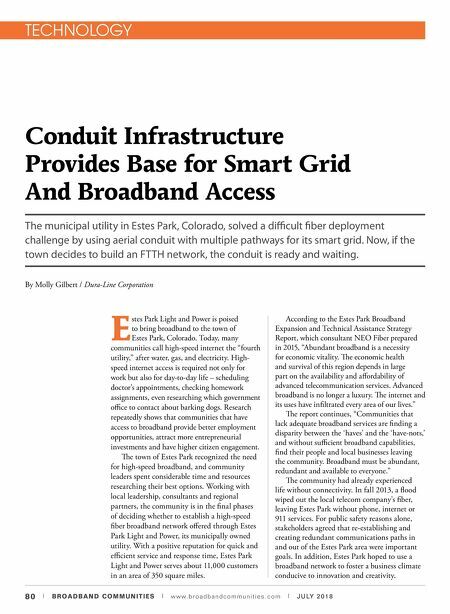 According to the Estes Park Broadband Expansion and Technical Assistance Strategy Report, which consultant NEO Fiber prepared in 2015, "Abundant broadband is a necessity for economic vitality. e economic health and survival of this region depends in large part on the availability and affordability of advanced telecommunication services. Advanced broadband is no longer a luxury. e internet and its uses have infiltrated every area of our lives." e report continues, "Communities that lack adequate broadband services are finding a disparity between the 'haves' and the 'have-nots,' and without sufficient broadband capabilities, find their people and local businesses leaving the community. Broadband must be abundant, redundant and available to everyone." e community had already experienced life without connectivity. In fall 2013, a flood wiped out the local telecom company's fiber, leaving Estes Park without phone, internet or 911 services. For public safety reasons alone, stakeholders agreed that re-establishing and creating redundant communications paths in and out of the Estes Park area were important goals. In addition, Estes Park hoped to use a broadband network to foster a business climate conducive to innovation and creativity.